The sleek two-wheeled vehicle is Silicon Alley-approved with smartphone integration and a dropout wonk as a founder, but there’s no mention of road safety or how it’d hold up in a crash. Now imagine a vehicle that’s smaller than a Smart Car, nearly a third of the price of a Nissan Leaf ($32,500), safer than a motorcycle with a range capacity that just lets you drive and won’t ever tip over? 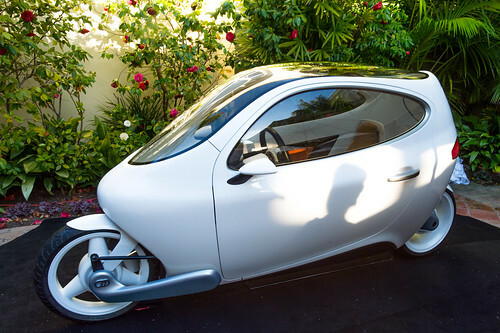 What you get is Lit Motors‘ C-1, the world’s first gyroscopically stabilized, two-wheeled all-electric vehicle, which launched at TechCrunch Disrupt in San Francisco today. The price of the C-1 will start at $24,000 and to drop to $12,500 by 2018. Photo by Fortune Live Media.